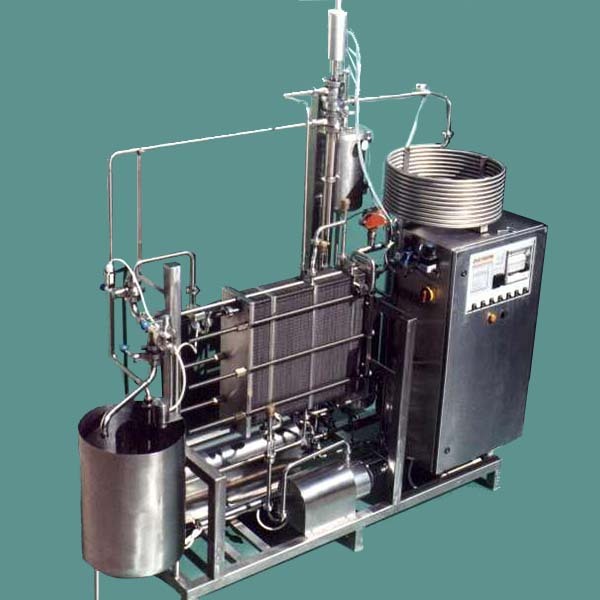 HTST milk pasteurizer is designed for the thermal treatment (pasteurisation) of drinking milk and dairy products or other food products as soft drinks and juices. Flash pasteurisation is the most effective process to destroy pathogenic microorganisms by heating the milk to a moderately high temperature for a brief period to ensure the quality and safety of raw milk. 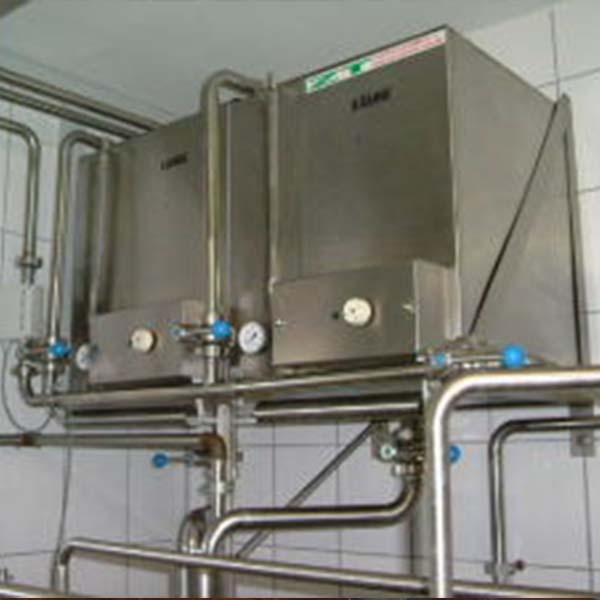 HTST milk pasteurization with a heat recuperation (heat regeneration) of 90% (energy is re-used) makes this equipment an environmental friendly system, which means that warm milk is used to heat up cold milk before it enters the pasteurizing part. 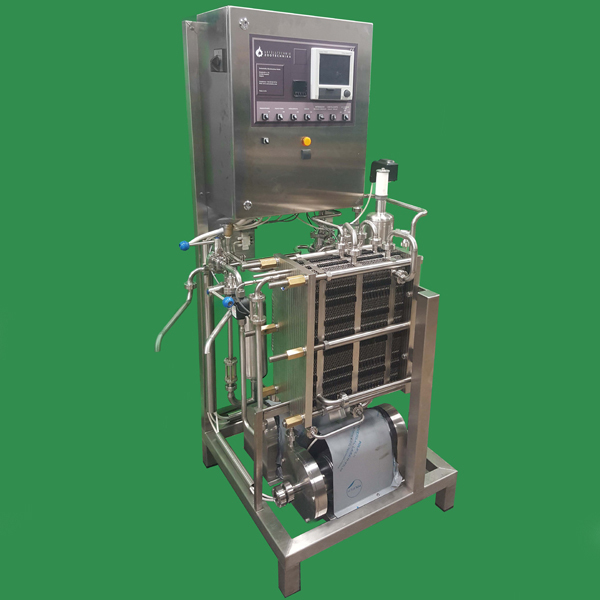 Our flow pasteurizers has been tested and approved by the Federal Dairy Research in Wolfpassing, product range is built according to European hygiene norms. The heat exchanger plates and frame are made of stainless steel. The milk and the heating circuit are equipped with stainless steel pumps. The milk is gently heated indirectly by the heating system using hot water. 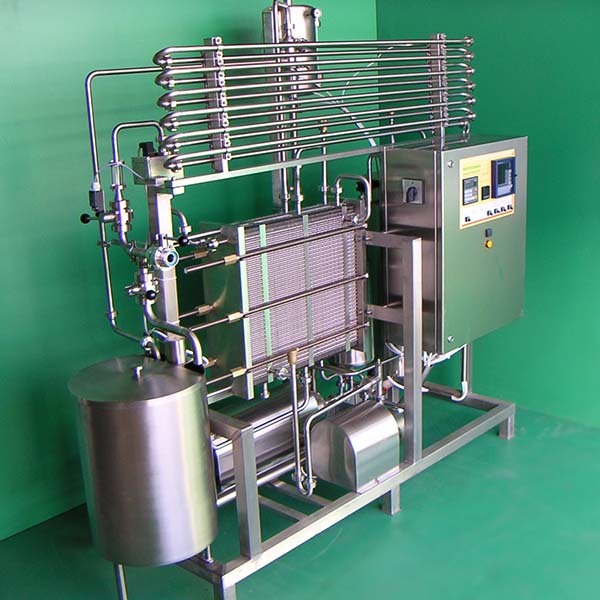 The pasteurisation unit includes all the necessary equipment for automatic pasteurisation of milk, as well as an automatic control system and an integrated temperature recorder. The package constitutes a tested filter system and a circulation cleaning system. An integrated after cooling with ice water is optionally available. With a suitable ice maker, the milk can be cooled down to 4 °C. Two product pumps: one delivers the product from (included) receiver tank through the heat recovery section, while the second pump is used as security overpressure pump through the pasteurizer, causing a high security pressure difference between outgoing (=pasteurized) and incoming (=raw) product. Tube section for 15-30 sec pasteurization temperature holding time, at min. 72 ºC. Security switch-over valve, one-seat version, for alarm cases, leading the product without pasteurization back to the receiver tank. Cooling supply requirements: ice-water, 1500 L/h, pressure 1 bar, or milk cooling tank according to the product volume. 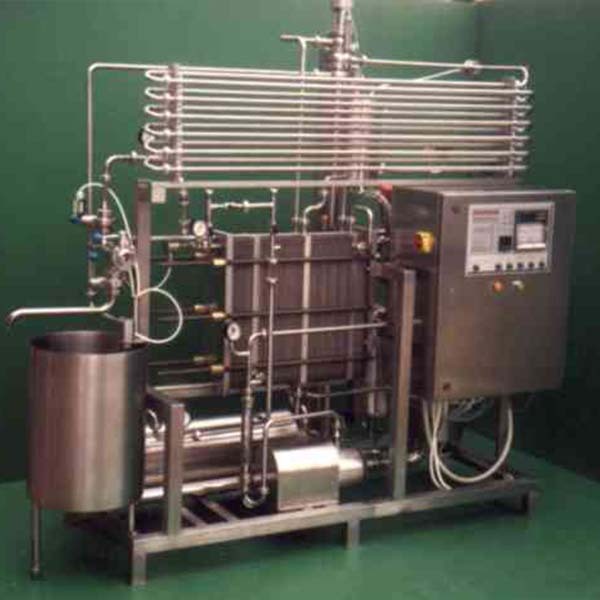 Plate pasteurizer with cooling of the heated milk by water in counter flow principle (ice water after cooling required). Heat recovery about 85%. 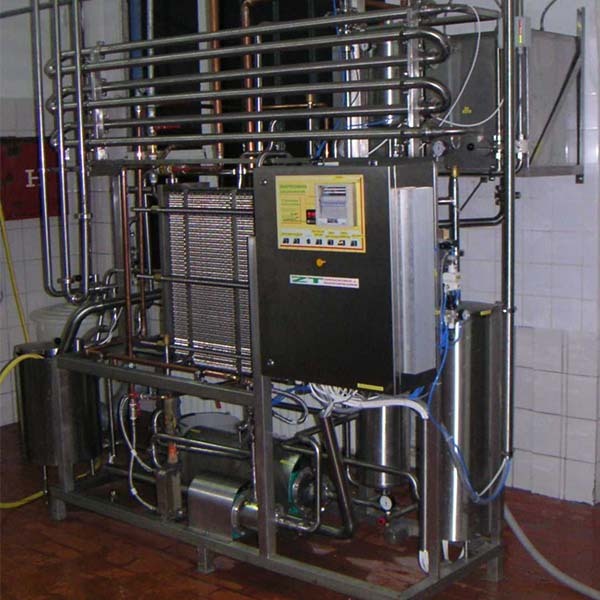 Plate pasteurizer with cooling of the heated milk by cold milk in counter flow principle (energy saving option). Heat recovery about 95%. 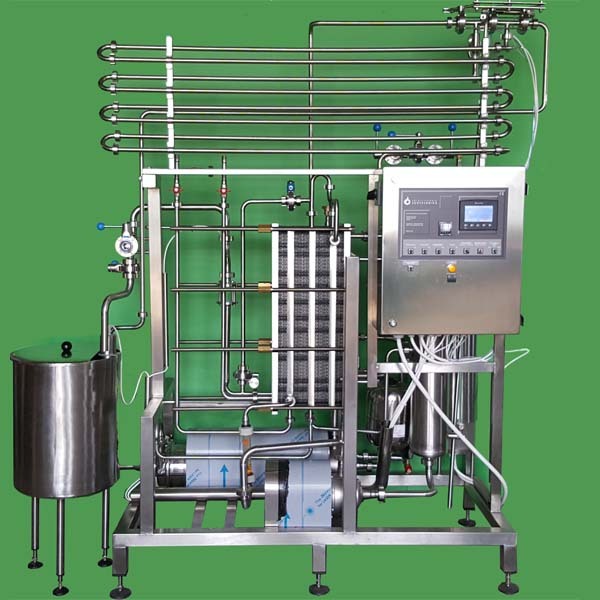 Micro pasteurizers with a capacity of 200 ltr/hour for drinking milk, cream, yogurt as well as other food products as soft drinks and juices.